Here are some ideas for kid friendly St. Patrick’s Day crafts to encourage creativity and practice fine motor skills. Holiday activities give your little one something to look forward to after school and during weekends. Read below to gather information on crafts for St. Patrick’s Day. These are great activities for children over six years old. Gather some multi-colored cereals (think fruit loops, lucky charms, etc. ), cotton balls, glue, heavy paper or cardboard, and a paper plate. Cut out the outer rim of the paper plate, and use the inner circle to draw five half-circle lines that will serve as a template for the rainbow. Your little one can sort through the cereal by color while you outline the project. After the rainbow template is complete, begin gluing colored rows of cereal to the paper. Your child can then pull apart some cotton balls and glue them to both ends for clouds. An extra challenge for this craft project may be making a pot of gold. Find some glass tea light candle holders. Then cut out a variety of shapes from different shades of green tissue paper. Paint some glue onto the glass and slowly add the pieces of tissue paper to make a paper mache project that will become a decoration used for multiple holidays. Children should always be supervised when working on crafts that use glass. For this activity you will need pasta that is good for beading such as macaroni or penne. Place the pasta into plastic baggies and add some liquid water color, shake so the color covers each piece, and then lay the pasta on wax paper to dry for one to two hours or until the watercolor has thoroughly dried. Then help your child string pasta along a long piece of yarn or string. Your child will enjoy helping you dye the noodles before beading some colorful jewelry. Always make sure to cute yarn or string long enough to fit loosely around neck to avoid choking. This craft is a great way for your child to make some St Patrick’s Day decorations for the home or their room. Form the foundation by cutting out its circular shape from cardboard (this could be from an old pizza box or another recycled object). After this initial step, you and your child can decorate however you want. If your child enjoys drawing and painting, let her create some designs on a piece of green paper. You both can cut out four-leaf clovers and other shapes to place on the wreath. Crumple up some green and white tissue paper and glue to wreath to add texture. Your child may also be interested in using festive glitter, stickers or other craft supplies. There may be a St. Patrick’s Day parade or other family friendly activities occurring in your area. Check your local newspaper, news sites or community center for more information. Want more information on activities for kids? 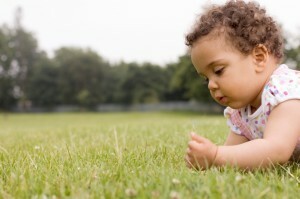 Get ideas for outdoor activities and tips for planning a family outing. 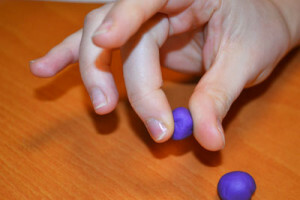 Try our DIY putty recipe and find hand and finger exercises to help with fine motor development. Next Next post: What Is Positional Plagiocephaly & Positional Torticollis?